Worm Poop (aka "Worm Castings" or "Black Gold" or "vermicompost") is a very powerful plant fertilizer that is also wonderfully gentle. One tablespoon full will feed a houseplant for a couple of months, but you can also safely plant seeds in it. 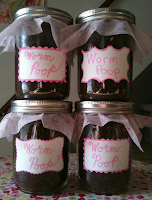 Party bonus: Worm Poop is completely clean and nontoxic! Sprinkle a couple spoonfuls of worm poop into the top layer of the soil of a potted plant. Remember that castings are very potent, so you don't need to overdo it. You can also mix in a little bit when you transplant. Note: this stuff is very dry so it will repel water at first. If you add a little water to the jar and let it soak, or work it into moist soil, it will soon be damp again. When planting annuals or perennials place a small handful of castings into each hole or you can sprinkle worm castings on top of garden soil. If you are starting plants from seed, add a small amount of worm castings in the bottom part of the soil. 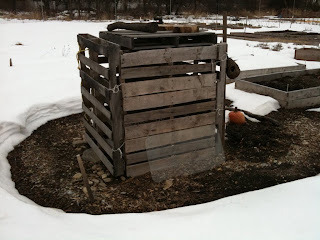 Once you transplant the seedlings place a small handful of vermicompost in each hole. This works for all types of plants! This is a good way to extend your worm poop farther. Add two tablespoons of castings to one quart of water and allow it to steep for a day, mixing it occasionally. The tea should be a light amber color when it is ready to use. If it is darker than that simply dilute with water. IMPORTANT: Water your plants with this "tea" on the same day you make it. Finally, here's a video to help you get acquainted with a few of my worms. If real, live, squirming, slimy, wiggly worms make you feel all oogie then you might want to skip it. But if you have heard me speak lovingly of them and would like to meet them, have at it! I have been increasingly concerned about mothballs in the homes of loved ones. I need to find a way to lovingly and firmly convince people that, if a home reeks of mothballs, the residents of that home are slowly being poisoned. I have only just started my research on this topic, so I don't have much to go on yet. Here is a brief overview, but I need to find some scientific studies to back up this information. If anyone has any information, please post here or feel free to contact me. I am mostly interested in how inhalation of mothball fumes may simulate symptoms of dementia in elderly humans. What is the Pollinator Pathway? Pollinating insects are in crisis, with populations plummeting across the U.S. The work that these tiny animals do to sustain plants and food crops– usually working out-of-sight and out-of-mind– is critical to not just their survival but our own. The Pollinator Pathway is a plan being developed by artist and ecological designer Sarah Bergmann to provide a model of support to the foundation of the food web. With a mile-long series of gardens in planting strips along Seattle’s Columbia Street, the project establishes a corridor between the two green spaces bookending the project-Seattle University’s campus at 12th, and Nora’s Woods at 29th. The project is also getting a lot of attention from the press. 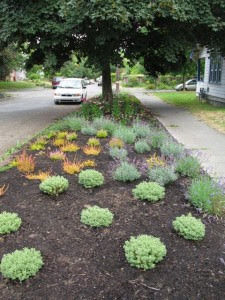 Here is an entry on National Public Radio's food blog that interviews scientists about the effectiveness of Pollinator Pathway's plan to convert small parking strips all over the city into gardens. The main idea is to plant small islands of native plants everywhere possible in order to create tiny sanctuaries for native insects that help pollinate our food crops. 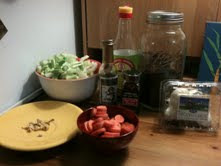 I just invented the most awesome recipe from a freshly picked bok choy given to me by my gardening friend, Ed. 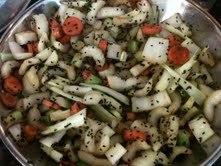 Ed has planted a lot of Chinese vegetables in his plot for his family to use, and when he gave me my bok choy he pointed out that they often make two different meals out of the same plant: soup from the stems and a stir fry from the leaves. I wasn't in the mood to make soup during these bright days of May, but my brain started thinking....I don't have to make soup, but I could still use two different recipes from the different parts of the plant. Oh-and he said to "toss" the flowers also since they are a delicacy. In a salad? I asked. No, to cook them. Of course, I don't have a wok or any other fancy cooking vessels. I just have a basic, stainless steel pan. I'm not brave enough to toss. Oil, lemon grass and ginger powder went into the pan first over a low flame with a cast iron heat diffuser between the pan and the stovetop. Onions and stems came next with flowers following soon after. Then I covered it all with a lid and let it simmer while I washed the dishes. After about a minute, I turned off the heat and spooned the whole colorful and lovely melange into two bowls - one for me and one for the fridge! I dubbed myself a genius and moved on to the next challenge: Nutty & Meaty! I have become a Beewatcher. In the same way that many erstwhile Birdwatchers prefer to be called Birders, I have dubbed myself a Bee-er. I go Birding. I also go Beeing. Here is my latest "observation" from a prestigious published source. In the following recent article, The New York Times has (partially) atoned for their poorly researched article of almost two years ago that claimed the bees are dying from a virus. "Scientists have been alarmed and puzzled by declines in bee populations in the United States and other parts of the world. They have suspected that pesticides are playing a part, but to date their experiments have yielded conflicting, ambiguous results. "In Thursday’s issue of the journal Science, two teams of researchers published studies suggesting that low levels of a common pesticide can have significant effects on bee colonies. One experiment, conducted by French researchers, indicates that the chemicals fog honeybee brains, making it harder for them to find their way home. The other study, by scientists in Britain, suggests that they keep bumblebees from supplying their hives with enough food to produce new queens. "The authors of both studies contend that their results raise serious questions about the use of the pesticides, known as neonicotinoids. "But pesticides are only one of several likely factors that scientists have linked to declining bee populations. 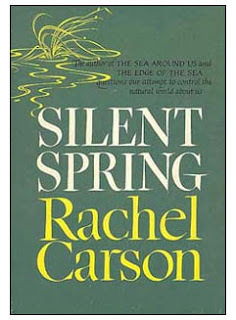 There are simply fewer flowers, for example, thanks to land development. Bees are increasingly succumbing to mites, viruses, fungi and other pathogens. "Outside experts were divided about the importance of the two new studies. Some favored the honeybee study over the bumblebee study, while others felt the opposite was true. Environmentalists say that both studies support their view that the insecticides should be banned. And a scientist for Bayer CropScience, the leading maker of neonicotinoids, cast doubt on both studies, for what other scientists said were legitimate reasons. "David Fischer, an ecotoxicologist at Bayer CropScience, said the new experiments had design flaws and conflicting results. In the French study, he said, the honeybees got far too much neonicotinoid. “I think they selected an improper dose level,” Dr. Fischer said. "Dr. Goulson’s study on bumblebees might warrant a “closer look,” Dr. Fischer said, but he argued that the weight of evidence still points to mites and viruses as the most likely candidates for bee declines. "The research does not solve the mystery of the vanishing bees. Although bumblebees have been on the decline in the United States and elsewhere, they have not succumbed to a specific phenomenon known as colony collapse disorder, which affects only honeybees. "Yet the research is coming out at a time when opposition to neonicotinoids is gaining momentum. The insecticides, introduced in the early 1990s, have exploded in popularity; virtually all corn grown in the United States is treated with them. Neonicotinoids are taken up by plants and moved to all their tissues — including the nectar on which bees feed. The concentration of neonicotinoids in nectar is not lethal, but some scientists have wondered if it might still affect bees. "In the honeybee experiment, researchers at the National Institute for Agricultural Research in France fed the bees a dose of neonicotinoid-laced sugar water and then moved them more than half a mile from their hive. The bees carried miniature radio tags that allowed the scientists to keep track of how many returned to the hive. "In familiar territory, the scientists found, the bees exposed to the pesticide were 10 percent less likely than healthy bees to make it home. In unfamiliar places, that figure rose to 31 percent. "The French scientists used a computer model to estimate how the hive would be affected by the loss of these bees. Under different conditions, they concluded that the hive’s population might drop by two-thirds or more, depending on how many worker bees were exposed. “'I thought it was very well designed,' said May Berenbaum, an entomologist at the University of Illinois at Urbana-Champaign. "But James Cresswell, an ecotoxicologist at the University of Exeter in England, was less impressed, because the scientists had to rely on a computer model to determine changes in the hive. 'I don’t think the paper is a trump card,' he said. "In the British study, Dr. Goulson and his colleagues fed sugar water laced with a neonicotinoid pesticide to 50 bumblebee colonies. The researchers then moved the bee colonies to a farm, alongside 25 colonies that had been fed ordinary sugar water. "At the end of each year, all the bumblebees in a hive die except for a few new queens, which will go on to found new hives. Dr. Goulson and his colleagues found that colonies exposed to neonicotinoids produced 85 percent fewer queens. This reduction would translate into 85 percent fewer hives. "Jeffery Pettis, a bee expert at the United States Department of Agriculture, called Dr. Goulson’s study “alarming.” He said he suspected that other types of wild bees would be shown to suffer similar effects. "Dr. Pettis is also convinced that neonicotinoids in low doses make bees more vulnerable to disease. He and other researchers have recently published experiments showing that neonicotinoids make honeybees more vulnerable to infections from parasitic fungi. “'Three or four years ago, I was much more cautious about how much pesticides were contributing to the problem,' Dr. Pettis said. 'Now more and more evidence points to pesticides being a consistent part of the problem.'" A version of this article appeared in print on March 30, 2012, on page A20 of the New York edition with the headline: 2 Studies Point to Common Pesticide as a Culprit in Declining Bee Colonies. I haven't seen much bee activity yet this season. Has me worried. However, here is the first recorded instance of a ladybug visiting my teeny tiny bee sanctuary! I headed over to Kris' world to check on her bee activity, and found that she is on hiatus from blogging right now (I knew she was overdoing it!) While I was there, I found out about the Great Bee Count on July 16, 2011 and I picked up a pretty good Mother Earth News article that encourages wild gardening in order to help bees. "During the past decade, over 150 municipalities and several Canadian provinces —Quebec, Ontario, Nova Scotia, Prince Edward Island and New Brunswick— have banned the use of 'cosmetic' lawn care pesticides because of health and environmental concerns. The bans have had the support of the Canadian medical community, including the Canadian Cancer Society and the Ontario College of Family Physicians. Similar legislation banning lawn pesticides is being considered in British Columbia and Manitoba." Sorry I missed April. Doing a lot of work in the garden! I've been following Beyond Pesticides for quite a while, mostly via feeds from their Facebook page, so I was really interested in this interview with Executive Director Jay Feldman. "There are a myriad of theories about the actual cause of Colony Collapse Disorder. Each cause is beginning to fit nicely under the effects of a new family of pesticides. For the past 3 decades, an organization called Beyond Pesticides (formerly National Coalition Against the Misuse of Pesticides), has been diligently addressing the impact of these chemicals and the process by which they are allowed registration. The organization's primary goal is to effect change through local action, assisting individuals and community-based organizations to stimulate discussion on the hazards of toxic pesticides, while providing information of safe alternatives. Jay Feldman, the Executive Director of Beyond Pesticides, has a 30-year history of working with communities nationwide on toxics, organic policies, and agricultural practices that maintain ecological balance, biodiversity and avoid reliance on toxic chemicals. Jay dedicated himself to finding solutions to pesticide problems after working with farm workers and small farmers, who suffered adverse health effects and property damage associated with pesticide use, through an EPA grant in 1978 to the national organization Rural America. Since that time, he has helped to build Beyond Pesticides' capacity to assist local groups and impact national pesticide and organic policy. He has tracked specific chemical effects, regulatory actions, and pesticide and organic law. Jay has served on EPA advisory panels, spoken to groups across the country and worldwide, contributed to the development of federal policy advancing chemical restrictions and green technologies, and was appointed by the Secretary of Agriculture in 2009 to a five-year term on the National Organic Standards Board. 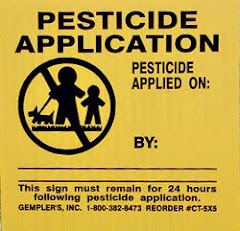 In this segment of The Organic View Radio Show, host, June Stoyer will speak to Jay Feldman, the Executive Director of Beyond Pesticides (http://www.beyondpesticides.org) to talk about this controversial subject. Stay tuned!" OK - I've finally narrowed it down to three top contenders for low-maintenance, productive, non-towering species to plant in our common space at the Community Garden (only my opinion, of course). For my earlier research processes, geeky gardeners can look here and here. Meanwhile, the post that you are reading contains the best of the best. "Mature size 6-8ft tall and spread. Berries are excellent and bear longer than most. I wouldn't think there would be much mess because it's more like a shrub with no canopy. I just planted 1 bareroot from Burnt Ridge Nursery, and the little thing already has a couple fruitlets. In fact all 3 of my mulberries have been in the ground less than a year and all have fruits forming. Great low care fruit trees! Oh, and try Burnt Ridge (as of spring 2011, no hits), Edible Landscaping (Spring 2011=not available right now), or Whitman Farms for Gerardi." The Honeyberry is extremely pest and cold resistant. Because it originated in Siberia, some (but not all) varieties might prefer shade in our Connecticut climate. It requires a companion pollinator planting. The Honeyberry (aka Haskap) is a non-vining (read non-invasive), bush honeysuckle which puts out edible, blue fruits with a yummy taste. I was initially interested in hazel nuts (aka filberts), because rumor has it that they are bush like. The downside is that the nuts take a long time to cure. They must be harvested before they are ripe because they attract squirrels. One source noted that the harvested nuts are typically ready to eat by December. I think that the Honeyberry or the dwarf Mulberry would be a better choice because of the immediate gratification factor (once they are established), especially for kids! Unfortunately the links in the plant finder, as great a tool as it is, proved to be less than permanent, so I lost quite a bit of my original research. At any rate, here are some of the runners up in my search. The variety that I found might not have been particularly cold hardy. Need further research. Geraldi Hybrid is a dwarf variety only seven feet tall with EXCELLENT pest resistance - try Burnt Ridge, Edible Landscaping, or Whitman Farms for Geraldi. One consideration - I think that Geraldi is a purple mulberry which the gardeners might not appreciate because of the messy factor (not to mention staining of EVERYTHING.) I couldn't find a dwarf white mulberry, but that might be something worth waiting for. The American types (as opposed to the Asian types) are best for the northeast. Excellent pest resistance, but no dwarf varieties found. There is a variety that averages a little over nine feet high. I think it needs companion plantings for pollination. Points lost for lack of kid-fun factor and need for pollinator plantings. No foolin'. There is a non-vining, Siberian (I think) honeysuckle which puts out fruit that tastes like blueberries. I'm thinking this might be the winner. I just attended the annual meeting of our local community garden and was sent home with the task of researching varieties of low-maintenance dwarf fruit trees for possible plantings in the common area at the center of the garden. 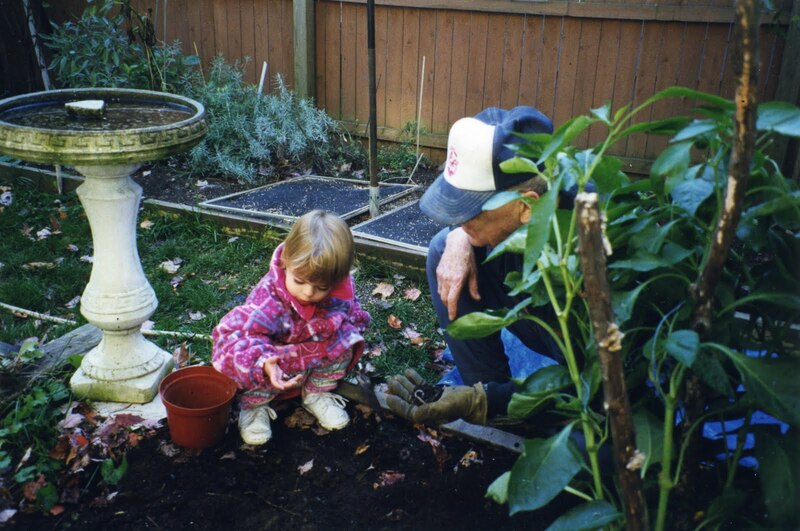 First I found an older article from Mother Earth News, excerpted from Designing and Maintaining Your Edible Landscape — Naturally , by Robert Kourik (copyright © 1986 by Robert Kourik). Good for background, but not too specific about modern varieties available. Next I'm going to spend some time here. OK-not so useful. University of New Hampshire makes pear trees sound a bit dicey, but I need to go back and read their paper on home-grown dwarf apple trees. ‘Thornton’ Starkspur Winesap is a dwarf apple (Malus pumila) hardy to minus 20 degrees F. A hybrid from Missouri's Stark Brothers, it stands between 8 and 10 feet high and wide. Its showy, fragrant white blooms appear in May, attracting bees and butterflies. The red fruit on trees in the coldest parts of its hardiness range--USDA zone 5--ripens in mid-October. While ‘Thornton’ is relatively resistant to common apple diseases and insects, it may require spraying to prevent pest damage, according to the Missouri Botanical Garden. This tree needs full sun and prefers well-drained, acidic (pH below 6.8) deep loam. Good fruit production requires pollination from another apple variety." So-I think I'll save these last two hits for further investigation. Until next time! "Making sure your vegetables are pesticide-free is especially important. "Did you know the Environmental Protection Agency (EPA) considers 60 percent of herbicides, 90 percent of fungicides and 30 percent of insecticides to be carcinogenic? Most pesticides can damage your nervous system and are associated with numerous health problems such as neurotoxicity, endocrine dysfunction, immunosuppression, impaired reproductive function, miscarriage, and even Parkinson's disease. "This information alone should be an impetus for buying local, organic produce. But there is another important factor to consider: Organic vegetables are more nutritious than conventionally farmed vegetables." I visited my garden on New Year's Day. All the plots were beautifully bathed in white after the recent Boxing Day Blizzard. 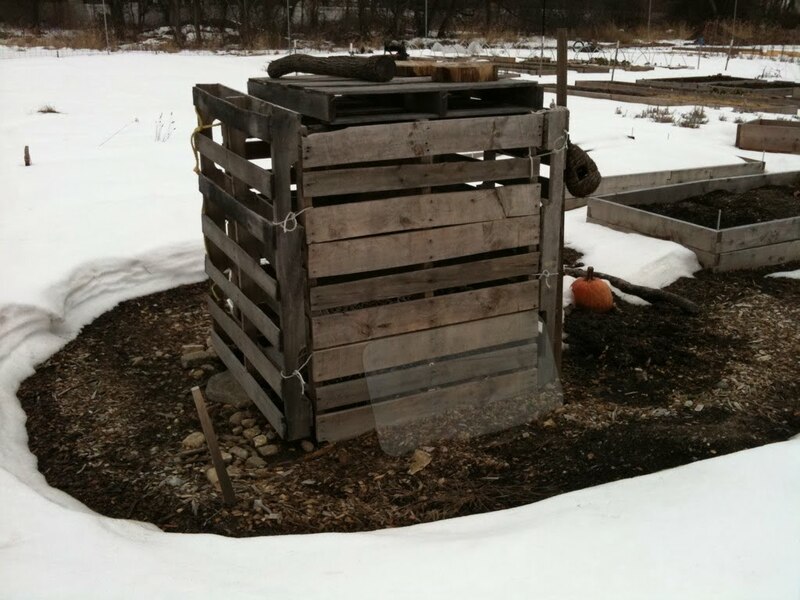 My composter appears to be giving off enough heat to melt the snow surrounding it, which means that all those microorganisms are still doing their job and converting all that organic matter into soil - yay! 1. It's a story about a school lunch program in California (of course) which is almost entirely organic. 2. It was created by teenagers and uploaded to Eco Company TV, a website "hosted by a dynamic group of teens who combine their natural curiosity with their enthusiasm to preserve the planet they will inherit." "Young Chinese farmers sowing seeds for organic revolution"
The small-scale farmer is a dying breed in China, made up mostly of the elderly left behind in the mass exodus of migrant workers to much higher-paying jobs in industrial cities. Today I planted my first plant in my new plot at the local community garden. My plot is right at the front of the garden near a busy school parking lot, so I have lots of visibility from the public. And I plan to use this visibility to get kinda political in my garden. I might even paint a hokey "Save the Bees!" sign. I hope this will be a successful haven for bees of all kinds. I hope to absolve my guilt over the time several years ago when I sprayed bee killer on an innocent nest of bumbles who had set up housekeeping in a woodchuck hole under the foundation of my house. Imagine my angst a few years later when I discovered that all of our pollinators - and therefore human agriculture and therefore human SURVIVAL - are in danger. AND that bumblebees buzz a lot in a really threatening way, but are not really prone to stinging people. Guilt? You betcha. As I proudly brought my pot of anise hyssop in through the garden gate - the bees in my home garden LOVE these flowers - I noticed a bumblebee clinging to one of the spikes of blue blossoms. Seems like a good omen to me! Not surprisingly, moms are sometimes strongly motivated to do research on pesticides for the sake of their children. I believe that observant parents can see how their children are affected by the world around them, whether for good or ill, and no matter what "science" tells them. Five years ago, author Audrey Schulman wrote a fascinating (and really well-written) story about her effort to research the nature of the pesticide used on her father's cranberry farm. Audrey writes, "Three years ago, while my extended family was vacationing at my dad's cranberry farm, he mentioned that one of his fields would be sprayed that evening. There were five children under 10 in the house, and I was eight months pregnant. The field was 100 feet away. I asked my dad about the pesticides, but he said, 'Don't worry. The government runs tests on the chemicals. They make sure they're safe.'" After some thorough reading at the website of the Environmental Protection Agency, Audrey learned that the safety experiments her father spoke of were all conducted by the manufacturers and then reported--often under strict confidentiality--to the EPA. "Although the analyses are performed by professional scientists, the results are often reported only to the EPA. They are rarely published in peer-reviewed journals, and must often be requested through the Freedom of Information Act, a process that can take years." "The son I was pregnant with when the cranberry bog was sprayed has developed slowly in different ways. He started talking so late the state sent a speech therapist over to tutor him. My older son, who was also there, can't draw. He's 5 now and gets frustrated trying to make even a stick figure. The one time he tried to draw me, it looked like an amoeba with three eyes. "Does this have to do with drifting pesticides? I can't tell you. None of us will know for sure the effects of these chemicals until there's good science involved -- science that isn't funded and reported by the very people making the chemicals in the first place." Not sure if this article is from the New York Times or not, but I wanted to note it for further investigation. Just found this recent article in Time magazine about a Harvard study that examined the amount of pesticide residue in the urine of children. The higher the rate of pesticides in a child's urine, the more likely that the child had ADHD. I think I'm starting my crusade soon. I started running across references to pesticides in my menopause research. Every time I get a little bit blue, I do some reading about menopause and...it doesn't exactly cheer me up, but it helps me cope. Anyway, pesticides are unexpectedly popping up in the literature about menopause. I sort of expected that pesticides cause tumors, etc. but it's sort of weird to think that they can be responsible for elevated levels of estrogen in the environment. There are also reports circulating (which I have yet to verify from multiple sources) that estrogen waste in our waterways are causing some male fish to change gender. I know there's more information out there, but let's start with this article from a British newspaper. In the 1970's, when bald eagles were endangered in the USA, the United States Government devoted a lot of effort toward saving our national symbol. Laws were passed to outlaw the pesticide DDT, which was identified as the major detriment to the health of this "totem animal." Time was devoted to educating the public about the dangers of putting poisons into the food chain. The population of bald eagles gradually rebounded enough so that in the 1990's, the species was reclassified from "endangered" to merely "threatened", and in 2007 was taken off the endangered list altogether. It's a wonderful success story. I think that sports teams named after animals, especially endangered animals, should contribute a significant amount of money and publicity toward the health and preservation of those species. This should include major contributions toward preserving the natural habitats of these animals. We can take this idea even further if we expand it to include team mascots. Notice how many of these major league baseball mascots are animals. There are some interesting essays about the relationships between birds and sports teams in the Sports Archive over at 10,000 Birds.com. Here is a fascinating article (with equally fascinating links) about live animal mascots used by college sports teams. Don't expect much reference to animal rights or animal conservation in these pages. Particularly disturbing to me is the plight of Louisiana State University's live mascot Mike the Tiger. So - for instance - do the Chicago Bears do anything to help the plight of bears in this world? Maybe even just a little public education? I couldn't find any such thing on their website, but I did find out that Staley Da Bear is interested in helping human children live healthier lives through exercise. Laudable but perhaps short sighted in terms of global health. I actually had this idea on the back burner for years when I started to write this post months ago. Last week I was standing in front of a class of eighth graders, killing some time by making conversation with them before introducing a speaker, when I heard myself say, "Have I ever told you guys my great idea?" I spilled it out in one or two sentences before moving on. But as we turned our attention to the business at hand, I heard a young woman in the front row say (almost to herself), "That's actually a good idea." Inspiration. Several years ago there was a weed killer commercial on TV that really bugged me. A bunch of little animated weeds walked and talked in annoying fashion and then got killed by some weed killer in a spray bottle because they were annoying and EVIL weeds. The thing that got my goat was the fact that all of the weeds were actually wildflowers that I know and love. Joe Pye Weed, dandelions, Queen Anne's Lace...yuck. 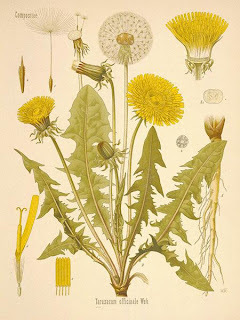 It was a dark representation of the old gardener's adage that there is no such thing as a weed, there are only plants that grow in the wrong places. I walk my indoor cats outside on leashes. Thank goodness that I live on two acres of land that is pesticide free. My landlord feels very strongly about not using pesticides and I am extremely grateful for that. Tonight, I'm too tired to be clever about my reasons for sharing my Pesticide Journey here. I just felt the need to organize my thoughts on this issue and to do some research. Maybe I can become more knowledgeable and formulate some balanced opinions BEFORE I become a raving, rabid, lunatic activist. So first, I am going to spend some time with these people.